Dhaka, Sep 1 (Just News): Ruling Awami League on Saturday outright rejected Bangladesh Nationalist Party’s demand for government resignation before the announcement of the election schedule. 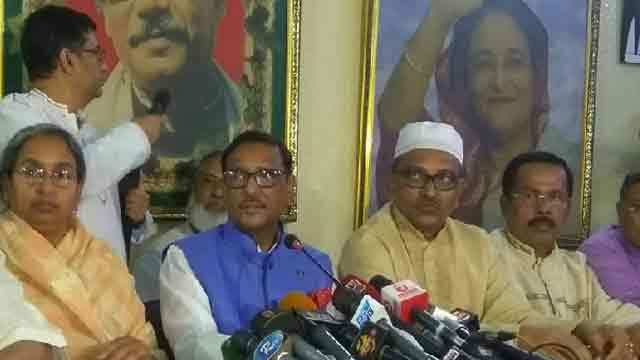 AL general secretary Obaidul Quader, at a press conference held after a meeting of the party secretaries at the party’s Dhanmondi office, said that the BNP’s demand that the government should resign before the national election was unconstitutional. The next general election would be held as per constitutional provisions and a mini cabinet would be formed which would perform only the routine works. Responding to BNP secretary general Mirza Fakhrul Islam Alamgir’s demand for government resignation before announcement of election schedule of the next general polls, road transport and bridges minister Quader said that it was impossible for the government to fulfill the demand made by BNP. ‘Moreover, BNP has failed to wage any successful movement against the government for a single day in the last ten years so that the government felt no pressure to cave to their demands,’ Quader said. Replying to another question regarding the release of BNP chairperson Khaleda Zia before the election by the government, Quader said that the government had nothing to do with BNP chairperson’s release and the court had given the verdict against her in a corruption case. Awami League had already started preparations for the next general election and was considering of giving 65 to 70 seats to its alliance members. Moreover, Awami League would finalise its sphere of alliance at the end of September, after holding discussions with Jatiya Party, Awami League led alliance and some others political parties, Quader said. Joint general secretaries Mahbubul Alam Hanif, Dipu Moni, Abdur Rahman, Jahangir Kabir Nanak, organizing secretaries Ahmad Hossain, Khalid Mahmud Chowdhury, secretaries SM Reazaul Karim, Sujit Roy Nandi, Biplab Barua and others attended the press conference.